- from a Founder's Day "Traditional"
On April 29, 1866, around four in the afternoon, President John H. Raymond arrived at Matthew Vassar's Springside residence, and invited him for a leisurely ride to the college. En route, Raymond diverted the founder's attention masterfully, guiding their conversation with such precision that when the two finally entered Main Gate, Vassar was left speechless at the sight of "Welcome to the Founder" banners unraveled on the evergreens and hordes of Vassar girls crowding the carriage path, waving handkerchiefs (1) as he passed. Once the campus population had congregated inside Main Building, the founder's seventy-fourth birthday celebration – a meticulously planned event including piano solos, lectures, and poetry readings – began. Upon retiring to a private room to recover from the excitement, Vassar, with tears pooling in his eyes, could manage but a single sentence: "This one event has paid me for every cent I have spent for the college." The annual tradition of Founder's Day began thus, as a surprise birthday party for Matthew Vassar. The festivities continued in much the same way for the next two years before the founder's death in the summer of 1868. In 1867, the faculty and students unveiled a Matthew Vassar bust. The next year – Vassar's last – Professor Frederick Louis Ritter composed and performed a cantata entitled "The Crowning Life." After the founder's death, however, the holiday was shrouded in solemn reverence; annual celebrations were offset by memorial services and visits to the founder's grave. From 1870 to 1911, Founder's Day underwent several changes, but ultimately, at least in the view of the Miscellany News in 1915, "lacked the spontaneity inspired by [Matthew Vassar's] presence." In 1870, for instance, the faculty incorporated a cotillion into the Founder's Day schedule, but students were not allowed to dance until 1874. Various speakers graced the campus to deliver traditional Founder's Day lectures, but after a short time the speeches grew tedious and invariable, and students lost interest. In an effort to revitalize the holiday, the Students' Association amended their constitution, allowing for a Founder's Day Committee comprised of a "chairman from the senior class, two members from each of the three highest classes, and one from the freshman class." AT THE FIRST Founder's Day, Lady Principal Hannah Lyman ordered the girls not to cheer as Matthew Vassar entered Main Gate, but to wave handkerchiefs silently, as cheering was considered "unladylike." After 1893, when Vassar's birthday fell on a Monday, the administration noted the scarcity of guests and enthusiasm, and voted to hold the holiday henceforth on the nearest Friday to April 29th. Still, with its uninviting annual lectures, Founder's Day seemed too similar to any other school day, and attendance dwindled. In fact, instead of participating in the festivities, the Vassar Chronicle observed many years later, students had often considered Founder's Day "a chance to arrive at Princeton a day earlier for House Parties." By 1910, when the administration declared the cotillion (which had by then become the main attraction) off limits to freshman and sophomores, it was evident that Founder's Day had lost more than its spontaneity; for a student body so far removed from any intimate memory of the founder, the holiday had also lost its original purpose of reverence and campus unity. In 1912, however, Founder's Day made a triumphant return with an unprecedented two-day celebration, commemorating the fifty years since the chartering of the college. Beginning with a morning of singing and a speech delivered by President James Monroe Taylor, the occasion called for a faculty-student basketball game, a performance of "Women of Culture of the Five Ages," and a "fancy dancing" exhibition. AS AN INTRODUCTION TO the day's festivities, the 1930 pamphlet reads, "In spite of the Julian Calendar and the recent efforts of Sears Roebuck we are taking time by the foreclock and celebrating the one hundred and fiftieth anniversary of the founding of the college which in the ordinary course of events would take place in 2015 AD. Such jumps are as nothing to the machine age in which we live. Science is wonderful that way. Thus for today we are projected into the future so come arrayed in what the well dressed projectile will wear, help inaugurate the new president, and start life all over again." While MacCracken's grammatical amendment was short-lived, his contributions to the style and execution of Founder's Day transformed the tradition altogether. After MacCracken became college president in 1915, plays and pageants began replacing the ever-unpopular annual lectures. In another effort to encourage student involvement, one 1920's Founder's Day Committee replaced almost all traditional activities (3)* with newer, more appealing ones like a faculty-student baseball game and an annual play. The first play written and performed by the faculty, Faculty Fodderville, appeared in 1928. For a long while after that, the faculty prepared a show each year, and went to great lengths to keep the theme top secret before the big day. Soon, themes became further integrated into the Founder's Day schedule. In 1928, a "County Fair" included snake charmers, fortunetellers, hayrides, a bowling alley, and a Kasper Kill Kaounty Fair vs. Fonteyn Kill baseball game (unfortunately the visitors, Fonteyn Kill, won). Two years later, the day turned Julian-futuristic, (4)* and the faculty performed Julius Caesar with President MacCracken ("Prexy") as Caesar. In 1939, the Committee – which by that point consisted of ten to fifteen students, faculty members and trustees – conceived "Utopina," a Utopian-themed Founder's Day. The program for that year depicts a world in which "college men" are available for rent in the college bookstore, library books can be checked out indefinitely, and daiquiris are served at the Retreat. Unfortunately, the day itself proved less ideal; it poured the entire time. BEFORE OBTAINING the elephant for the 1942 Founder's Day Circus, the Committee attempted to rent a hurdy-gurdy, but discovered a little known Poughkeepsie ordinance forbade the playing of hurdy-gurdies within city limits. After MacCracken retired, the impressive theatrics of the day died down somewhat, and by 1954, the Vassar Chronicle announced hopes to "revive interest and meaning" in Founder's Day. To this end, the Committee organized a performance that sought to define "what Vassar stands for today" and "its role in modern society." Three years later, English professor Walter Stone wrote and the faculty performed From Peer to Maternity, a musical-comedy spoof in which William Faulkner, T.S. Eliot, James Joyce, and Ernest Hemingway visited Vassar in skits such as "The Gorge Also Rises." At this point especially themes had a tendency to roll with the times. 1948, for instance, brought "Fedora Day," while '59 centered on the emergence of television and '88 featured a Back to the Future parody entitled, Matt to the Future. (7) During the second half of the twentieth century, despite countless cultural and societal changes, Founder's Day maintained its jovial atmosphere and imaginative themes. During this transitional period, organizers put less emphasis on faculty-student interaction, and focused more on the idea of Founder's Day as a brief escape of sorts – a time for students to evacuate the libraries, cast worry from their minds, and unite with the greater college community. One photograph of President Alan Simpson in May 1975, in which he raises the founder's mug and toasts the beginning of Founder's Day (8), seems to epitomize this new era in the ongoing tradition. 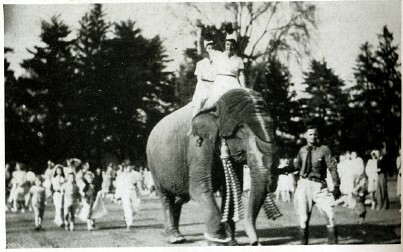 With the emergence of coeducation, the societal pressures of the 1970's and 80's, and the legalization of alcohol on campus, Founder's Day patrons eventually ditched baseball games and plays for rock shows and beer, just as the students of the 1920's had bid farewell to annual lectures and chapel services. Today, while the definition of what Founder's Day entails continues to change, what remains constant is the manner in which most students still await the day with the same frenzied anticipation of – I imagine – those handkerchief-waving girls of 1866, who gathered inside Main Gate to catch the look on the founder's face as he rounded the corner, widened his eyes, and froze in that moment of unspeakable happiness. The only remaining traditions at that time were the morning chapel service and the grave visit. Today, only the latter is a regularly Founder's Day event. Before obtaining the elephant for the 1941 Founder's Day Circus, the Committee attempted to rent a hurdy-gurdy, but discovered a little known Poughkeepsie ordinance forbade the playing of hurdy-gurdies within city limits. (Ruth, Murray. "Time: The Present." VAM. June 1941). In the 1988 spoof Matt to the Future, Matthew Vassar travels forward in time with the help of charter Vassar trustee and inventor Samuel Morse, and observes the fruits of his creation. The skit features, for instance, a mock-Art 105 lecture, in which faculty faces were superimposed onto famous works of art. This has since become a Founder's Day tradition. (See May 1975, "Spring at Vassar" – Vassar College Special Collections).